PAGE UPDATED: 10th December 2003. Dec. 10th is " HUMAN RIGHTS DAY." " THINKING CRICKET with AJITH C. S. PERERA"
"Cricket with Travel to Sri Lanka." ENGLAND IN SRI LANKA - 2003. REGULARLY UPDATED AS THE TOUR UNFOLDS. Yes all those lucky people (you will soon realize why so!) who have already confirmed arrangements (or are about to confirm, let's say) to be with the English Cricket Team this winter, you are destined to experience very soon the very best cricketing holidays in a Country that has long been one of the most exotic holiday destinations in the World, SRI LANKA! Unlike the wet weather of November, December usually has always been sunny and bright and above all the coolest of all months for us!! Let us hope that Cricket will, this time, be the winner, as I extend the warm hand of friendship to all our visitors, especially those from the UK, the country with which I have had over 25 long years of very close on-going association, through CRICKET and CHEMISTRY, both. 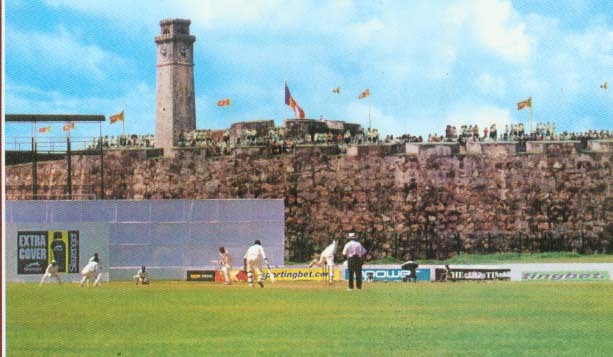 Cricket was played in Sri Lanka since 1832. But their emergence as a cricketing power undoubtedly came when they were crowned the World Cup Champions in March 1996. It was indeed an incredible victory for the entire Nation, which brought in immense fame and much glory. Ever since then, the island is fast gaining greater international recognition through the field of Sports, mainly CRICKET, than that already gained around otherwise, such as for the best quality tea, the fantastic variety of gem stones from rubies to sapphires and cat's etc., the wealth of wild life including a unique elephant population, great scenic beauty varying from the palm fringed golden beaches of its coasts to the highlands of the interior, and then of course the smiling and friendly people with a very high literacy rate of about 83%, well known for their great hospitality backed up with a rich cultural heritage which dates from 3rd Century B.C. We are certainly beholden to the British, who not only brought this fascinating game here, but, also in so many ways taught us its finer points and, more importantly, the 'Spirit' in which it should always be played along with its rich traditions. Cricket in fact, is not merely a Game, and in Sri Lanka, it is a way of life to almost the entire population, ever since that 'Golden Day' of 1996. * Supports body's Immune System. * No side effects as drowsiness or loss of appetite.